I just installed a Honeywell RTH221 thermostat, that I bought at Home Depot. The manual that came with the unit is cryptic, and assumes that the color code was adhered to, when the heater was installed. Of course, it was not, and I only have the heater hooked up. No AC, so I only have two wires. Thermostats are basically simple devices. They have a few switches. One closes when the heater is to be ON. Another one closes (makes contact) when the AC is to be ON. Sometimes there is a third to close to turn ON a ventilation fan, for both moving heated or cooled air. I worked them out myself, with an Ohmmeter. I put it in heat mode, and checked for continuity, across all terminal combinations, with the Heat ON and OFF. Did the same to find the cooling contacts, and the fan contacts. Then I found this diagram on the web, which confirmed my findings. I had to do this because both Honeywell and Home Depot were no help. Its rated for 40VA (or 40W, if the load is purely resistive). I’ve found AC coil relays drawing 1/2 amp (500mA) ! This to me seems to be a ridiculously high current. I commonly use electromechanical relays with coils that draw 150mA (1/6th amp), that have several 30A contacts. Very heavy duty relays. I don’t know what kind of neanderthal technology the use in the HVAC biz. For non-HVAC use, this xfmr can also be used as an auto-transformer. You can stick 120VAC in, and get 208V or 240V out, on the extra primary taps. They are intended to be used when 208 or 240VAC are available, but can also be used as outputs, if isolation is not needed. 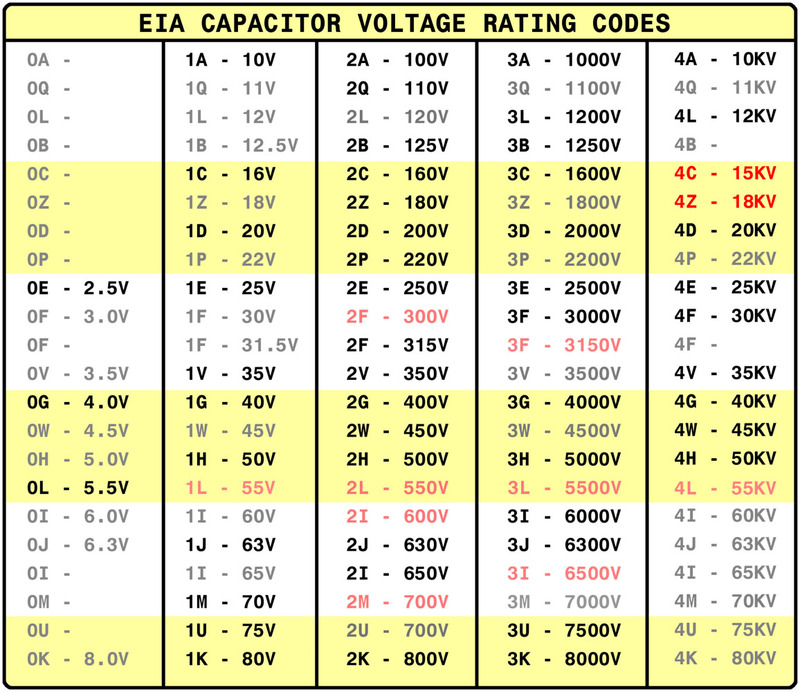 These are the extended, and projected, EIA voltage codes. The BLACK ones are verified codes. The GREY ones are natural projected extensions, of the code, but not verified. The RED and PINK ones are problematic, and illustrate inconsistencies in the code. For example “I”, such as 2I and 3I. “I” could be for “60”, or “65”. 2I stands for 650V, while 3I represents 6000V. These are man made, industry conventions, not scientific laws, so be careful. Handy guide in trying to find how much power your transformer can put out. Note this chart was published in 1937, in the United States. San Francisco to be more precise. It assumes 60Hz (cps back then), also metallurgy, and production methods of that period. Still useful though. The rated power corresponds with the cross sectional area, of the core, that is surrounded by the windings. See pink area in the cores drawings. There are various ways to bias a tube amplifier stage. 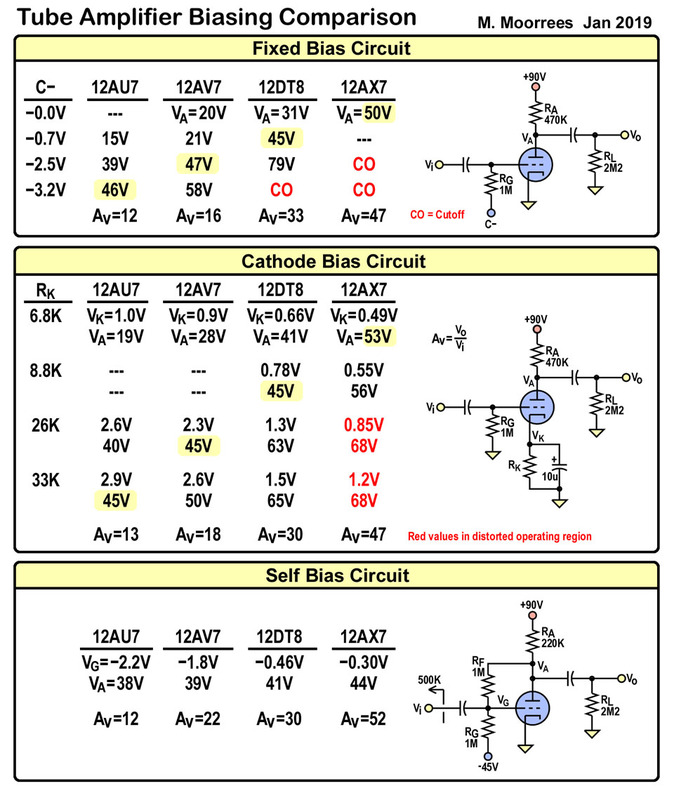 Two of the most common methods are Fixed Biased and Cathode Biased. 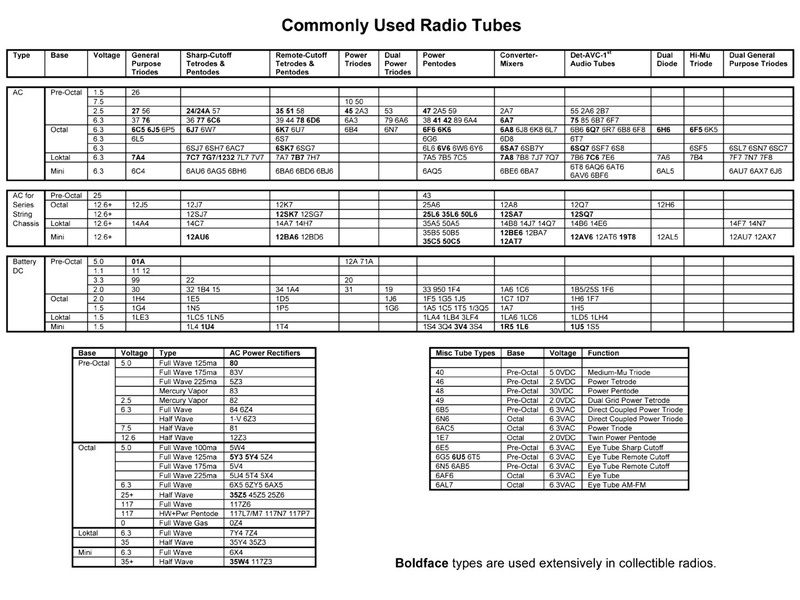 Cathode bias, is by far the most used, both for small signal stages and power output stages. Fixed bias is not used much for small signal (preamp) stages, but has become popular in power stages, due to guitar amplifiers using most of the currently produced vacuum tubes. Cathode bias is more stable due to the inherent feedback built into it. But if you want a more noticeable twang, as with electric guitars, you don’t want that regulating feedback, hence fixed bias. The problem with fixed bias, is that as the tube ages, and wears out, the bias point will drift. But sometimes you can’t use cathode bias. I found that to be true, when making my 3-channel tube color organ. It uses a 6EZ8, which contains 3 triodes in a miniature 9-pin package. Two of the cathodes, though, are tied together, to each other, and one of the filament leads. This forces me to ground those cathodes, leaving me with only the fixed bias option. That bothered me, so I came up with a 3rd solution, borrowed from modern transistor circuits, in the form of self-biasing. As with the transistor circuit, a resistor (RF) is used to make a feedback path from the plate (VA) to the grid (VG). But tubes need to be biased negative to the cathode. A second resistor (RG) is added to pull the grid negative. Ideally, the bias point, on the anode (VA) is desired to be half of the supply voltage. 45V for VA, with a 90V supply, in this case. If RF is made equal to RG, then the bias voltage ideally should be equal and opposite to VA. So -45V in this case. The table above, shows how the three biasing schemes compare. The self biasing scheme looks very good, and I’ll use it tube circuits in the future. A rising ramp is made using a 22K resistor and a 0.47uf cap, for a ~10mS time constant. The cap is discharge at every negative half cycle thru a 1N4004 rectifier. This ramp is fed to the emitter of a PNP transistor. The level for determining the brightness, is fed to the base of this same transistor. The more negative this signal, the brighter. That’s because the difference between the base and emitter, comes earlier in the cycle, the more negative the base potential. Any voltage can be fed to the base, including a Cadmium Sulfide (CdS) photocell divider, a potentiometer, or the envelope of an audio signal. Here is a video demonstrating the circuit, with a CdS photocell controlling a (C7) night light lamp. (Click here to watch). Method (a) is basically the first way TRIACs were driven, when introduced in the mid 50’s. TRIACs are used to throttle power to a load, by only letting a small portion of the AC cycle pass to the load. Its a form of pulse wave modulation (PWM). A TRIAC can only be ON or OFF. In method (a), The AC wave is passed thru an RC network. Depending on the value ratio between the R and C, the resultant AC wave will be delayed. When the voltage of that wave exceeds the break-over point of the DIAC (or neon bulb, in earlier circuits), the DIAC will conduct and dump the C value into the TRIAC gate. Once ON the TRIAC will stay ON, until the AC cycle goes to zero, which it does twice per cycle. So even though the gate trigger current may be as high as 50mA, the brief period it takes to dump a small cap, lets say 0.01uf, will still be enough to turn ON the TRIAC. This method works in Quadrants I and III, where the polarity of the gate matches that of the output terminal (T2 or MT2), in both halves of the cycle. This method is still used on inexpensive lamp dimmers. Method (b) is used when the controlling circuitry needs to be electrically isolated from the AC. This method is usually hidden inside devices known as solid-state relays. There are special opto-isolators known as photoTRIACs. They are like most photo-couplers, except that the output device is a TRIAC. These TRIACs can’t pass to much current. Usually only about 100mA maximum, so the photoTRIAC drives a larger TRIAC, by routing the power TRIAC’s T2 to its gate. This will only cause a brief high current pulse, because once the main TRIAC turns ON, the T2 voltage will drop close to the T1 voltage. A small current limiting resistor, ~100 to 300 ohms is all that’s needed to protect the opto-device. This method also operates in Quadrants I & III. Method (c) is used when the controlling circuit directly drives the TRIAC, and isolation is not needed. The driving circuit can be a logic gate, an op-amp, or voltage comparator stage, a microcontroller, or even a descrete transistor. Usually the control signal varies from zero to some positive voltage, relative to T1 (MT1). This circuit operates in quadrants I and IV (4), so it requires a special group of TRIACs known as Logic TRIACs. These TRIACs are more sensitive than ordinary TRIACs, with Quadrants I, II, & III, needing as little as 3mA, and Quadrant IV, as little as 5mA. These are also a subclass of 4-mode TRIACs. Its very important that the TRIACs used in such applications will work in Quadrant IV. This circuit uses only one stage to form a window comparator. The window here is when the AC sine wave is near zero volts, or better known as a zero crossing detector. A diode (or rectifier) has two leads (terminals): (1) an Anode, and a (2) Cathode. You can almost always see that the cathode side has a stripe painted on the body, near that lead. Sometime the printing equipment was not lined up properly, and the “stripe” is too close to the center. In this case, look for any text. Usually a part number. That text will be on the anode side, since that’s where most of the space is suppose to be, if it was aligned properly. Just because, that’s what it was designed for, originally, doesn’t mean you’re stuck using that way. Think outside the box ! Most of the low cost AC power inverters, and output of UPS’s (uninterruptible power supplies) output whats called a modified sinewave. That’s a very loose term, since the waveform is anything but a sine wave. Much closer to a square wave with “shoulders” at the zero point. For modern electronics, this is fine. Modern electronics use switched mode power supplies, that convert the AC input to high voltage DC, which is then chopped up at a high frequency (10’s of kilohertz to upto a megahertz) before feeding a transformer. In the old days, however, line frequency (50 or 60Hz) transformers were used. These transformers expected true sine wave inputs, not modified (excuses) of a sine wave ! Frame (2) of the photo, above, shows what happens to the output after feeding the inverter wave, into a simple low frequency transformer. Note the distortion of the wave, and the difference of the two “zero” shoulders. ~2V, in this example, which is caused by the magnetic hysteresis, of the transformer core. Also those sharp transitions cause high voltage transients, when applied to a inductor (the transformer), in frame (3). Care should be taken, when plugging anything one of these inverter circuits. True sine wave inverters are available, and easily identified due to them being much more expensive, for the same rated power output . Note: shown for voltages. Also applies to currents, if the load is resistive. RMS (for Root Mean Squared) is the equivalent DC applied to the same load, to use the same amount of true power (watts). Not apparent power (VA). An “anode” is connected at the midpoint of the filament. The filament also is partially coated with an oxide (white), towards the end terminals, to dramatically increase the thermal emission. 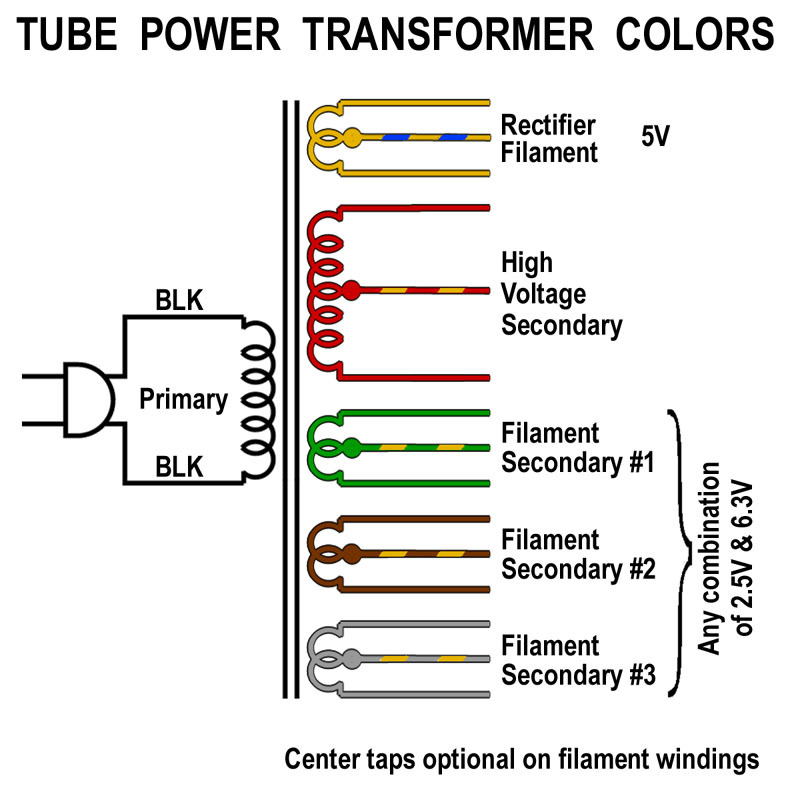 This was universally done with lower power vacuum tubes in the old days. The opposite ends of the filament alternately act as cathodes, when they are at the negative portion of the AC cycle. The anode tap roughly sits at near zero volts. 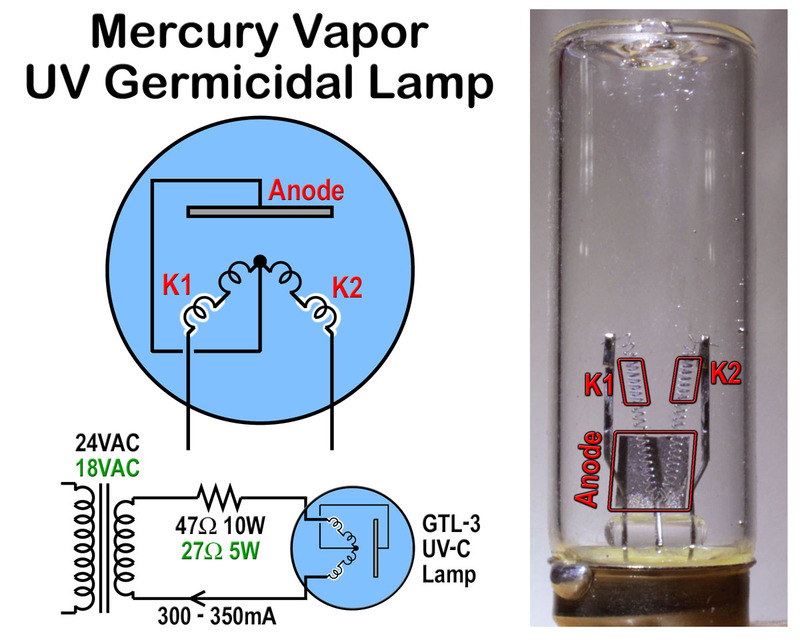 Since an extra conduction path occurs during emission between a “cathode” (K1 or k2) and the filament, the voltage drop will be somewhat uneven.